Today’s February 20th. That means it’s the kickoff to a wonderful thing called the Love-a-Thon! It’s hosted by the beautifuls from Alexa Loves Books, The Novel Hermit, Stay Bookish & the Daily Prophecy. CANADA, BABY! And I’m currently very upset by this since winter decided that it wasn’t over and proceeded to shove away the warm, glorious sun. My jaw is still frozen from a 5min walk without a scarf. To be honest I have no idea. I think at this point I was just pitching names around, seeing which were taken as domains and which weren’t. Typed in PenMarkings, page unavailable, boom! Blog name. YA fantasy, mainly! Although sometimes I do dive into other YA genres. DANGEROUS GIRLS, hands down. No question. Fight me. I love to shop for notebooks! And random art supplies. Usually they end up unused for years (which was why I only window-shop now instead of actually buying them). Oh, it’d be something HUGE. Like the library from Beauty and the Beast. But bigger. Waaaaayyyy bigger. That’s it! 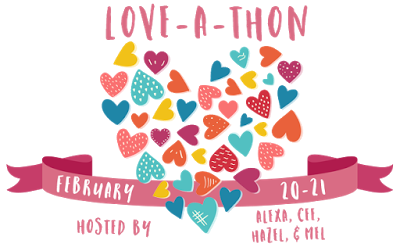 Check out those blogs I’ve lined to at the top for a list of every single blog participating in the Love-a-Thon! I definitely love YA fantasy too! Have you read The Shadow Queen by CJ Redwine yet? One of my favorites ever <3 Happy Love-a-Thon!